The second named storm of the 2014 Atlantic Tropical Storm & Hurricane Season has formed and is taking aim at the Caribbean islands, with maximum sustained winds of 50mph and possible rainfall amounts of up to 10 inches locally in some areas. Update 15:40 GMT 4th August: Tropical storm Bertha has now become Hurricane Bertha, the second named storm of the season and now the second to reach hurricane status. Hurricane Bertha has 80mph sustained winds but little change in strength is expected until Tuesday when Bertha will begin to weaken as it moves north to eventually become extra-tropical. There are no threats to land. Update 07:30 GMT 4th August: Bertha has now passed the Bahamas and has intensified to a tropical storm with sustained winds of 65mph. 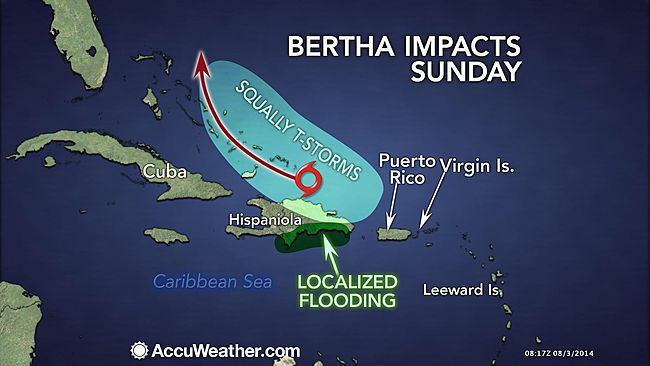 The storm is forecast to become hurricane Bertha in the next few hours, the second storm to reach hurricane status this season, but no impact to the U.S. or to Bermuda is expected while hurricane Bertha maintains a northerly track. Original post: At the moment tropical storm Bertha is not forecast to become a hurricane or to threaten the U.S. coastline, however with the path Bertha is taking the forecasts could change as the storm interacts with the Caribbean islands it comes closest to and passes over warm waters. Currently tropical storm Bertha is situated north-east of Barbados and is heading for the islands of Martinique and Dominica. Bertha is moving northwest at around 21mph and carries maximum sustained winds of 50mph, with some higher gusts. The storms upper level winds are currently not favourable for further development in the next 48 hours, according to the NOAA. At the moment the greatest threat from tropical storm Bertha appears to be heavy rainfall amounts in some Caribbean island nations. Wind shear is expected to inhibit further development of the storm, at least until later on Saturday. After that time, although the forecast models are in consensus currently that Bertha will emerge past the Bahamas and curve northeast, there is some uncertainty as has been proved by other storms taking a similar track in past seasons. A low pressure system in the U.S. is expected to force Bertha out into the Atlantic, keeping the storm away from land. However the uncertainty could come if Bertha managed to intensify around the Dominican Republic or Cuba to the Bahamas, which would depend a great deal on the exact path. It is not unheard of for storms tracking across the Caribbean like this to curve west into the Gulf either, but at the moment for Bertha this does look unlikely. Storms like Bertha, with mid-strength tropical winds but high moisture and rainfall levels, can cause significant impact in the Caribbean. The Caribbean Catastrophe Risk Insurance Facility (CCRIF) is, of course, exposed to this storm and as a result so is its recent World Bank – CCRIF 2014-1 catastrophe bond. The CCRIF cat bond, while calibrated with the same type of trigger as the underlying facility, is likely only designed to respond to very major hurricane losses, so most likely very safe from a storm like Bertha. However some of the CCRIF’s products could be exposed to a combined wind and rainfall loss if Bertha made a damaging hit on any of its members. The map below from Accuweather shows the expected areas of impact currently. We will update you should the forecast change dramatically or should Bertha strengthen into a hurricane. Tropical Storm Bertha, located approximately 150 miles (240 kilometers) east-southeast of Martinique, is currently tracking west-northwest at 21 mph (33 kph). Bertha is disorganized this morning. While satellite imagery shows a well-defined low-cloud swirl exposed just west of the main thunderstorm mass, reports from an Air Force Reserve Hurricane Hunter Aircraft show that the wind field more prominently resembles that of an open wave. The aircraft did report some stronger tropical storm-force winds to the east-northeast of the center, which is the basis for the NHC increasing the initial intensity to 50 mph (85 kph). The initial motion is towards the west-northwest, and over the past few hours Bertha appears to have accelerated. The cyclone is currently being steered by the flow around the Bermuda High and this should continue for the next 48 hours or so. After that time, the cyclone is expected to turn northward into a break in the ridge caused by an advancing trough over the eastern United States. This should be followed by recurvature into the westerlies over the Atlantic Ocean to the north of Bermuda. The forecast model track guidance remains in good agreement with this scenario, and it has changed little since the previous advisory. The new NHC forecast track is an update of the previous forecast. Bertha is currently experiencing moderate levels of southwesterly vertical wind shear, and water vapor imagery shows dry mid-/upper-level air near the storm. The forecast track calls for Bertha to interact with one or two upper-level troughs during the next 48 to 72 hours, which should cause some shear and dry air entrainment to continue. This, combined with the current lack of organization, suggests little change in strength should occur during the next 48 hours. After that time, Bertha is expected to move into an environment of less shear and greater moisture and the NHC intensity forecast does call for modest strengthening during that time. However, the NHC forecast is weaker than most of the model guidance. An alternative scenario is that a combination of shear, dry air entrainment, and land interaction causes Bertha to degenerate to a tropical wave during the next 48 hours, followed by possible regeneration in the 72- to 120-hour timeframe when the system reaches the more favorable environment. Tropical storm conditions are expected to first reach the warning area this afternoon, making outside preparations difficult or dangerous. Tropical storm conditions are expected in Puerto Rico and the Virgin Islands on Saturday. Bertha is expected to produce rainfall amounts of 1 to 3 inches with isolated amounts up to 6 inches across portions of the Leeward Islands and U.S. and British Virgin Islands. Rainfall totals of 3 to 6 inches with isolated maximum totals of 10 inches are possible across Puerto Rico, with the heaviest totals across the southern portion of the island.